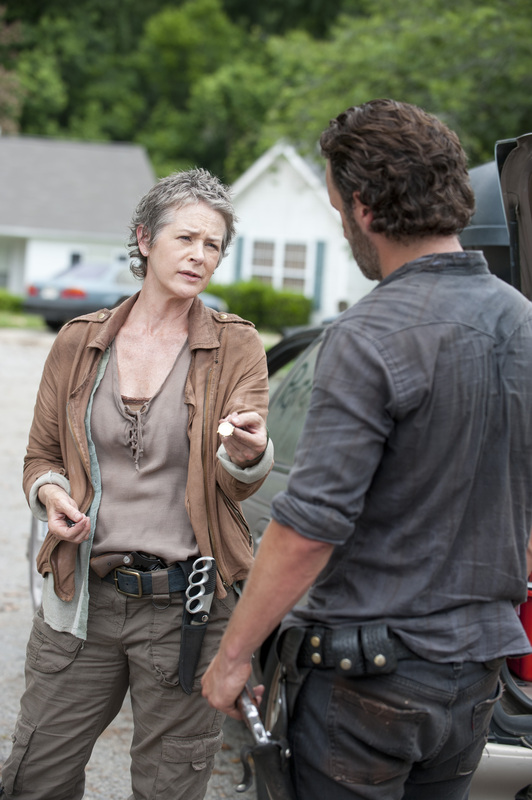 Rick is still coming to grips with Carol’s revelation in the previous episode, and envisions Carol murdering Karen. He heads outside, towards his car, and discovers one of his knives are missing. Meanwhile, Carol is talking to Lizzie and tells Lizzie to stay strong. Lizzie says she is expecting a lot of people to die, that’s what “always happens”. Lizzie also insists that the zombies aren’t inherently bad, they’ve just changed. Daryl’s group continues to press onward, and they take another break. Tyreese is out of sorts and refuses to listen to Michonne’s urging to hurry up as Tyreese tries to clean his shirt of all of the walker blood. Nevertheless, they continue pressing on towards the animal hospital, and find an auto shop covered in ivy. Tyreese assaults the ivy with anger and a lot of force and a walker lunges at him from the ivy. The walker is tangled, but Tyreese refuses to kill it, leaving Michonne to finish the job. Inside the auto shop, the group conveniently discovers that there is a minivan inside that is function but needs a working battery. As they get to work installing it, Michonne confronts Tyreese over what happened and realizes that Tyreese is near-suicidal. She tells him to stop being angry and that if anyone should be angry, is Michonne at the Governor. Rick and Carol set out on their own, entering a small town to look for more supplies. They search around and wind up stumbling upon a young couple named Sam and Ana, hiding in a house. Suspicious of them, Rick ask Sam and Ana the same three questions he had asked Clara in the season premiere. Sam and Ana give good enough answers that Rick reluctantly says that he and Carol will take Sam and Ana back to the prison with them. Sam and Ana are both injured, however, Ana having a bum leg and Sam dealing with both a dislocated shoulder (which Carol resets) and cuts from glass. Daryl’s group finally makes it to the animal hospital, and they split up and get to work on getting the needed supplies for the infected civilians. Bob finds a bottle of alcohol and manages to sneak it into his bag when no one’s looking, at the expense of room for medicine. On the way out, however, walkers ambush them and the group flees. They make it out of the hospital and onto an isolated runway when Bob nearly loses his bag and has to recover it. When Daryl sees the alcohol, he loses his temper. When Bob draws his gun Daryl really loses his temper and tells Bob they shouldn’t have brought him along. They finally head back towards the prison. In the town, Rick and Carol pick fruit when they hear noises. They run to investigate and discover walkers devouring Ana’s body. They decide to leave and head to their assigned destination to wait for Sam, but Sam ultimately never shows up. 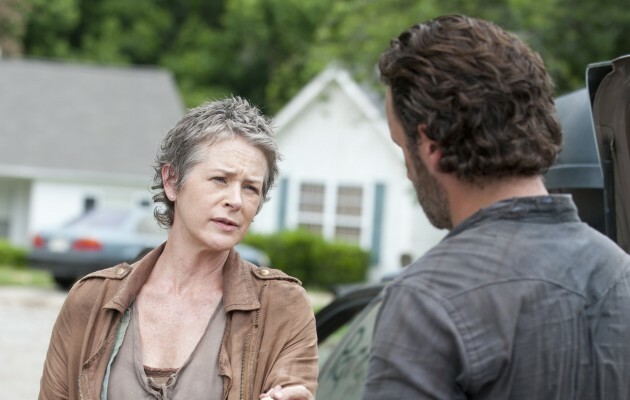 Rick finally confronts Carol over the burned bodies. He says that he will have to leave her behind for what she did, as Tyreese could kill her or the others might shun her for what she did. He gives her supplies and a working car, and then he begins driving back to the prison alone. They could not have picked a worse title for this episode from a meta perspective because this is precisely how I feel about this episode. This was basically “what to do about Carol” completely drawn out over the course of the episode. And conveniently Ana is disposed of and Sam is nowhere to be found right after they’re introduced. That was frankly lazy as it makes Rick dodge the consequences of his actions at the end of the episode by exiling Carol. Rick and Carol’s absolute indifference to Ana being eaten also says a lot about how the characters have changed since the beginning, nothing really fazes them anymore . . . which actually ties into the title of this episode quite well. I’m not entirely convinced that Carol is the one who did it, I think it’s pretty plausible she’s covering for someone else. Who, I don’t know. It’s probably not Lizzie (though Lizzie’s blindness when it comes to zombies is becoming maddening), I don’t see Lizzie or her sister being capable of pulling off such an act. But ultimately, not a lot happened which is why this recap is so short. It’s basically a bunch of short-to-describe scenes drawn out as much as possible to fill a 44-minute episode.